Cardi B has shared an adorable video of her seven-month-old daughter Kulture saying “mama”. 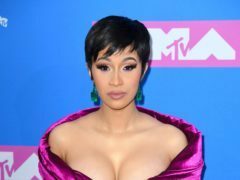 Cardi B has urged people not to “bash” her estranged partner Offset after he crashed her show in Los Angeles. Offset has begged for forgiveness from estranged wife Cardi B after she left him over his alleged infidelity. Cardi B has shared the first picture of daughter Kulture, hours after announcing she had separated from husband Offset. Cardi B has achieved her “childhood dream” of buying her mother a house. Cardi B celebrated her first wedding anniversary by sharing a picture of the secret ceremony. Cardi B teased her upcoming collaboration with Selena Gomez and included a sweet nod to her newborn daughter.